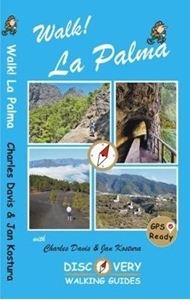 Walk La Palma is Charles Davis’ Discovery Walking Guide exploring the walking possibilities one of the steepest islands and unspoilt walking destinations in Europe. The guide covers a range of walks including routes in Barranco de la Madera, the southern Volcanoes, Santo Domingo, Cubo de la Galga and Roque Palmero. The routes pass through diverse landscapes including the craters of volcanoes, sub-tropical forests and coastal paths along the island’s 1080 kilometres of way-marked paths. There are also easier short walk and family alternatives for those seeking more leisurely days out. The guide describes a total of 34 GPS waymarked walking routes on La Palma and each has been thoroughly researched. An extensive introduction provides information on the island’s climate, when to go, getting there and around, equipment, risks, flora and fauna, rating and drinking, tourist attractions and a note on the historic town of Santa Cruz de la Palma. There is also useful guidance about map and walking information including details of walk location regional maps and using GPS on La Palma. Each walk gives an overview of the route and colour keys indicating difficulty, times, total distance, vertigo risks, ascents and descents and if refreshments are available on route. Detailed appendices provide walkers with a summary of GPS Waypoints Lists, recommended maps and books, useful websites, accommodation, camping advice, restaurants, mountain bike itineraries, taxis and bus timetables, with way-marked routes that cross them. Detailed walk descriptions are accompanied by 1:40,000 scale extracts mapping the route and GPS waypoints at every key point on the walk as well as colour photographs illustrating some of the highlights of each walk covered in the guide.